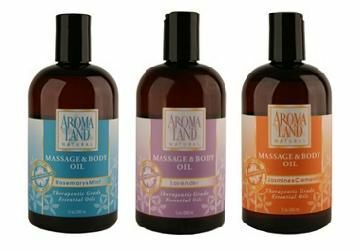 Give the full massage experience and stimulate more than one of your clients' senses with a bottle of Aromaland Aromatherapy Massage Oil from MassageTools. Each one is made from cold-pressed plant oils such as grape seed, rosehip, sweet almond, safflower and sunflower oils that are enriched with vitamins E and C. These oils are combined with scented essential oils for therapeutic benefits. Each of these massage oils were developed by professional massage therapists and are meant to soften and nourish all skin types. These 100 percent natural oils give you a smooth glide and easy grip during deep tissue massages. Choose from Lavender, Jasmine & Clementine, Rosemary & Mint, Ylang Ylang & Ginger, Lemongrass & Sage and Tea Tree & Lemon scent blends. -Scented with pure Essential Oils in a rich plant-based massage oil. -Softens and nourishes all skin types. -Developed by professional Massage Therapists. Jasmine & Clementine - Jasmine, Clementine, and Rose that offers an exquisite, romantic, and embracing aromatherapy experience. Lavender - Bulgarian Lavender, Lavendin, Orange, Geranium, Cedarwood, Marjoram, and Frankincense. We now also offer an unscented massage oil, so you can add any of your favorite essential oils and make your own. I paid for another kind of oil but it was back ordered. I was contacted about the back order and decided to send either lavender again or another type of oil. I have not received it. Very good item. Performs well. The massage oils are excellent, and when they didn't have the ordered product in stock, they contacted me immediately to let me know the status and when to expect it. They delivered when they said they would.